Life is about finding a balance that works for you. What works for you will not work for everyone. Like Goldilocks, we each must find what is just right for us. I am constantly tweaking the formula, but I have discovered that my balance is found by mixing extremes. Rather than towing a line of moderation straight down the middle, I zig left, then extreme right and seek the law of averages to place me somewhere in that middle space. I eat celery and drink smoothies not because I prefer them to regular food, but because when you seek to counter balance the amount of cakes, cookies and candy I consume (a lot, by any human standards), you realize that for every bite of donut there should be an equal and opposite bite of not-donut... so, yeah, celery. My insatiable sweet tooth fuels my walking, and my walking works off the spoils of my sweet tooth. Balance. Professionally, I am much happier going through bursts of extreme productivity and efficiency and then taking any additional time remaining to rest and recharge. That balance means I will have the energy and brainpower to resume productivity again. Balance. My house is almost always clean, usually tidy and never, ever without several things piled up that still need to be dealt with. Balance. Earlier this month was my daughter's 5th birthday. She has spent a large portion of her five years immersed in the wonderful world of Disney and Disney princesses. So when she took a liking to another princess, Leia, and her intergalactic friends, I jumped at that opportunity to teach her a life lesson: a life lesson in balance. We had a Star Wars themed party at the movies. 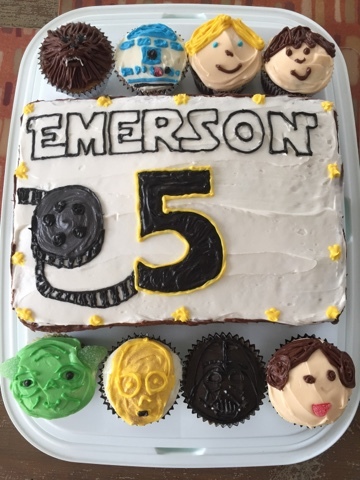 Though we felt the kids were too young to watch Star Wars, I delighted in wasting spending large swathes of time leading up to the party coming up with Star Wars related food puns. Pinterest and the internet provided endless ideas. I also found a way to express my own creativity and served Jabba the Hummus and Obi-Wan Ka-Coffee with our C-3-P-Oreos. If I could find a job that requires pop culture themed food puns, I think I would have found my calling. The day before the party I was stressing that I was sick, my son was sick and I still had to make the cake for the party. My sister alerted me to the fact that I was ridiculous (sisterly honesty at its best). Why make my life more complicated? Why not just go buy a cake? I couldn't explain it then, but I think I know the answer. Balance. I love making cakes for parties. Not just my kids, but for friends and family as well. Another talent I have yet to find a way to monetize. Or, more likely, if it were a source of income, would it cease to be a source of fun and satisfaction? A debate for another day. Today is all about balance. In making the cakes for her party, I somehow let myself off the hook for the rainy mornings where my impatience is on permanent display and I yell for the fifth time to "get your shoes on already!" In my mind, the cakes balance my jerkiness. Just as our fun afternoons baking balance my losing my mind when she cuts up a book and her own hair. Sitting and playing with her offsets the hours I let her watch movies so I can get some other work done. It is my brand of balance and it works for me. By that same logic, I accepted the stomach bug I got four days after her party as a way of balancing the 18 leftover "Leia Cinna-buns" I had eaten that week. Balance. I hope she remembers the cakes and forgets the crankiness. If she manages to remember them both, I hope she finds a way to appreciate the balance, as I have.